Established in 2001, Genesys Conference & Banquet Center is operated by Epoch Hospitality Group, one of Michigan’s finest Hospitality Management Companies. Since 1982, Epoch Hospitality has operated some of Michigan’s foremost restaurant establishments and catering venues. Contact us today to book an event to be remembered! ​Under the direction of General Manager, Collene Eller, ​our Executive Chef and award winning service team will make your event one to remember. Leave all of the details to us when you book your business meeting, wedding reception, family gathering or class reunion. 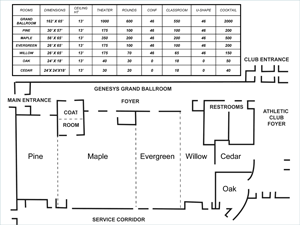 The Genesys Conference & Banquet Center can seat groups from six to 600. Our 10,000-sq.-ft. ballroom can be divided into six separate areas for multiple concurrent meetings or convention needs. If lunch is on the agenda, let us set up an area away from the meeting to allow your guests the comfort of eating in a pleasant atmosphere. The Genesys & Banquet Center is located just off I-75 at Holly Road, Exit 108, just minutes from US-23 and I-475. Within 70 miles of 2/3 of Michigan’s population, we will be the ideal meeting place for your conferences. If an overnight stay is on the agenda, we will assist in finding the perfect accommodations for your lodging needs. Located inside the Genesys Athletic Club offering signature wraps, salads, smoothies and much more to check on the latest scores with WI-FI available for your business needs. Our 10,000-sq.-ft. ballroom can be divided into six separate areas for multiple concurrent meetings or convention needs.